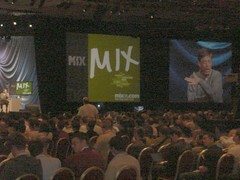 I've uploaded a bunch of my Mix06 pics. 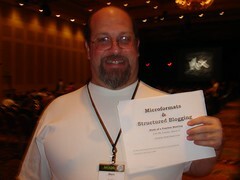 My favourite is this one of Marc Canter advertising his microformats and structured blogging session he is running later today. Yesterday Marc asked Bill Gates a question around open APIs. I think he liked the answer. Dwain Silverman has some links to Mix06 posts and gada.be has a bunch of search results too.